Location: 100KM West of Abu Simbel, Egypt. Grid Reference: 22° 32' 00" N, 30° 42' 00" E.
The stone circle at Nabta is special in several ways. Firstly, it is the only megalithic circle in Egypt, but perhaps more importantly, it was situated on the Tropic of Cancer (presumably deliberately), which makes it one of the first known examples of an astronomic observatory in the world. The suns rays, on the summer solstice, strike the ground absolutely vertically and no casts no shadow for several minutes. In March 1998, a team led by Southern University Methodist Anthropology Prof. Fred Wendorf announced that they had found the megalithic site. The site consists of a stone circle, a series of flat, stone structures and five lines of standing and toppled megaliths. Romauld Schild of the Polish Academy of Sciences confirmed that one of the megalithic lines was orientated in an east-west direction. The Nabta Playa basin has been occupied by humans since around the 10th Millenium BC (1), There is evidence of cattle domestication, perhaps offering the first suggestions of the later cattle veneration seen in the early Egyptian dynasties. 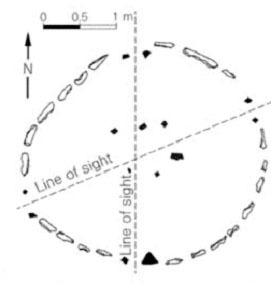 Alignments - Five megalithic alignments at Nabta radiate outwards from a central collection of megalithic structures. The small stone circle contains four sets of upright slabs, two of the sets being aligned in a north-south direction while the second pair of slabs provides a line of sight towards the summer solstice horizon. An east-west alignment is also present between one megalithic structure and two stone megaliths, which stand about a mile distant. Furthermore there are two other geometric lines involving about a dozen additional stone monuments that lead both north-east and south-east from the same megalith. (16). Nabta, being on the Tropic of Cancer, for one day only, on the summer solstice, the suns rays strike the ground absolutely vertically and upright stones cast no shadows for several minutes. An assembly of huge stone slabs found in Egypt's Sahara Desert that date from about 6,500 years to 6,000 years ago has been confirmed by scientists to be the oldest known astronomical alignment of megaliths in the world. Known as Nabta, the site consists of a stone circle, a series of flat, tomb-like stone structures and five lines of standing and toppled megaliths. Located west of the Nile River in southern Egypt, Nabta predates Stonehenge and similar prehistoric sites around the world by about 1,000 years, said University of Colorado at Boulder astronomy Professor J. McKim Malville. The Nabta site was discovered several years ago by a team led by Southern Methodist University anthropology Professor Fred Wendorf. 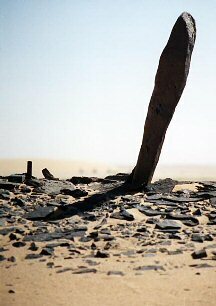 A 1997 GPS satellite survey by Malville, Wendorf, Ali A Mazar of the Egyptian Geological Survey and Romauld Schild of the Polish Academy of Sciences confirmed one of the megalith lines was oriented in an east-west direction. A paper on the subject by the four researchers will appear April 2 in the weekly British science journal, Nature. "This is the oldest documented astronomical alignment of megaliths in the world," said Malville. "A lot of effort went into the construction of a purely symbolic and ceremonial site." The stone slabs, some of which are nine feet high, were dragged to the site from a mile or more distant, he said. The ruins lie on the shoreline of an ancient lake that began filling with water about 11,000 years ago when the African summer monsoon shifted north. It was used by nomads until about 4,800 years ago, when the monsoon moved southwest and the area again became "hyperarid and uninhabitable." Five megalithic alignments at Nabta radiate outward from a central collection of megalithic structures. Beneath one structure was a sculptured rock resembling a cow standing upright, Malville said. The team also excavated several cattle burials at Nabta, including an articulated skeleton buried in a roofed, clay-lined chamber. Neolithic herders that began coming to Nabta about 10,000 years ago -- probably from central Africa -- used cattle in their rituals just as the African Massai do today, he said. No human remains have yet been found at Nabta. The 12-foot-in-diameter stone circle contains four sets of upright slabs. Two sets were aligned in a north-south direction while the second pair of slabs provides a line of sight toward the summer solstice horizon. Because of Nabta's proximity to the Tropic of Cancer, the noon sun is at its zenith about three weeks before and three weeks after the summer solstice, preventing upright objects from casting shadows. "These vertical sighting stones in the circle correspond to the zenith sun during the summer solstice," said Malville, an archaeoastronomer. "For many cultures in the tropics, the zenith sun has been a major event for millennia." An east-west alignment also is present between one megalithic structure and two stone megaliths about a mile distant. There also are two other geometric lines involving about a dozen additional stone monuments that lead both north-east and south-east from the same megalith. "We still don't understand the significance of these lines," Malville said. During summer and fall, the individual stone monoliths would have been partially submerged in the lake and may have been ritual markers for the onset of the rainy season. "The organization of these objects suggest a symbolic geometry that integrated death, water and the sun," Malville said. Although some believe the "high culture" of subsequent Egyptian dynasties was borrowed from Mesopotamia and Syria, Malville and others believe the complex and symbolic Nabta culture may have stimulated the growth of the society that eventually constructed the first pyramids along the Nile about 4,500 years ago. "The Nabta culture may have been a trigger for the development of social complexity in Egypt that later led to the Pharaonic dynasty," he said. The Nabta project was funded primarily by the National Science Foundation. The site also contains a wealth of cultural debris, including small, fire-blackened stones from ancient hearths built along the ancient lakeshore as well as manos, metates and carved and decorated ostrich eggshells. 16). C. Knight & R. Lomas. Uriel’s Machine. Century. 1999.